the light and hope that ease the pain..."
Til the World Ends. Three Dog Night 06/75. 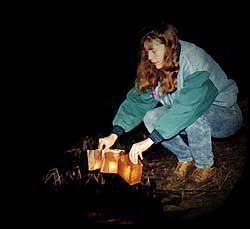 On December 6, 1989, fourteen female engineering students from the ecole polytechnique in Montreal, PQ were mercilessly gunned down by a deranged gunman, simply because they were women. The Government of Canada proclaimed December 6 as a National Day of Remembrance and Action on Violence Against Women. 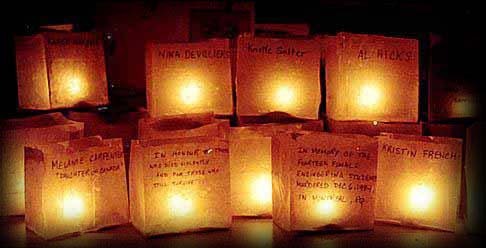 In 1990, the Women's Action Coalition of Nova Scotia launched a Purple Ribbon Campaign to pay tribute to the fourteen women murdered December 6, 1989 in Montreal to raise public awareness on violence against women. Members of the tiny community of Bear River, Nova Scotia, have marked their remembrance of this tragedy by the floating of candles down the Bear River to honour memory of all victims of violence; those who have died as well as giving hope to those victims who still survive. that violence is an everyday occurrence.